My next book will be “crowd funded,” meaning it will be built on a community of supporters. I want you to join, and I will certainly make it worth your while, particularly in three ways. You see, five years ago one of my daughters went on a blogging rampage against me, my family, and entire communities I am part of. Some people joined her, giving incredible testimonials of physical, emotional, and religious abuse. Tabloids and online gossip sites picked up the story and elevated it to an extremely humiliating level. Thing is, it was fabricated. All of it. Today the fuller story is coming out. Wendy and I have weathered nearly five years of online attacks and a ravaged reputation, but so much was going on behind the scenes that was untold. It’s quite remarkable, but it will take a mammoth amount of effort and resources to bring it to light. When the story dropped, we intentionally chose to ignore the smear, a “rebuttal of silence” I like to call it. For lots of reasons, we resisted the temptation to defend ourselves. I’m a debate coach, so tearing apart evidence is easy for me, but our family needed serious counseling and help, not divisive arguments. We even sought legal advice, and though we had a rock-solid defamation case, litigation would have torn our family further apart. We love Cynthia. At the time three sisters joined in her smear campaign, and it left the rest of the family devastated. Today over half of our 16 children are adults, and none of them are backing Cynthia’s online narrative anymore. 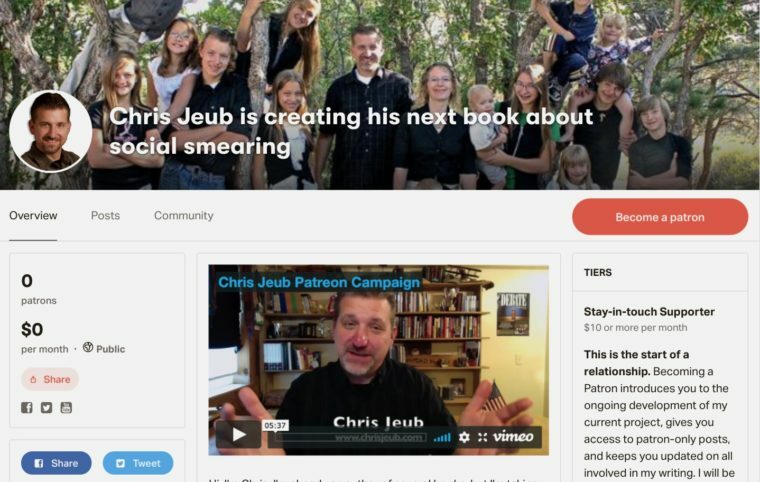 They all have lives — marriages, careers, reputations to hold — but doing a Google search of “Jeub” will bring up all the old discredited articles again. Our family needs and deserves vindication. Wendy and I had a great mission five years ago. We were on television, we published books, we made YouTube videos, and we counseled other parents through the weathering trials and tribulations of family life. We had a good thing going. Love in the House: Filling Your Home With the Greatest Commandment was our flagship story — the true narrative of our home — and it was a mission. That mission was hijacked. Our faith and life choices were shaken at its core. Our family suffered humiliation from a slander that we couldn’t answer, and it led many of us into anger, depression, and anxiety. We never had our day in court to prove our innocence. This was so unjust, so wrong. But we’re ready to return. I have so much to share with you, to catch you up on. My Patreon Campaign will pull back the curtains and show you the full story. The parenting community. Parenting can be tough. Wendy and I loved encouraging parents to bring it on, but we have been ravaged with vile hate from the “childless by choice” crowd. They literally hate families and children. The homeschooling community. We were pioneers of sorts. After the scandal, five homeschool conferences dropped us as keynote speakers. It was a tremendous loss. The Christian community. We wrote much about the dangers of legalism and led many to a life of Grace and Hope. But this life was mocked by the online mob. The education community. I took an English teaching position at a charter school in town, and a small gathering of parents lobbied to have me fired. All things considered, I don’t blame them. I’m accused of abuse, and I teach their children, so of course they were concerned. They deserve an honest, truthful explanation. The speech and debate community. Beyond my daughter there was an online mob — some of my former students, no doubt — who call themselves “homeschoolers anonymous.” They used my training to tear many families apart. There are more communities, too, even some that align contrary to our values and faith. Wait till I share with you how communities of anarchists, “gamers” (male seducers), leftists, and atheists roll into our drama. You will probably find some of my stories unbelievable. Do you see why this book needs to be crowd funded? There are so many people who have been affected by my family’s story. They need hope — and that starts with a fully exposed explanation of the truth. Joining my Patreon Campaign will deliver the truth first hand and reward you with access to my work. The greater community is integral in my story, and you will get to be a part of it. When the defamation dropped in 2014, little was known of the modern phenomenon of “social smearing.” Slandering someone publicly used to be reserved for the rich and famous, but the tabloid culture is now available to all through social media. Anyone with a lie and a Facebook account can ruin a person, even an entire family. Perhaps you’ve experienced it, or you know someone who has. You’ve definitely seen it in the news. Entire reputations are devastated in a flash, a product of our post-modern culture. Our world doesn’t care for the truth, making anyone — anyone! — suspect to lies and fabrications that can destroy. Perhaps social smearing is the greatest unwritten injustice of the day. My family’s story is in the center of it. This story is much, much bigger than me. Which is why this project should be crowd-funded. You should be a part of this project, replacing much hope back into the world. I’ve weathered through it, learned so much from it, and want to share it with you — and as many people as possible who need to hear it. Help me clear my schedule, write this story, and publish a product that makes a fantastic impact in the world. Your patron support will bring this most important story to light.